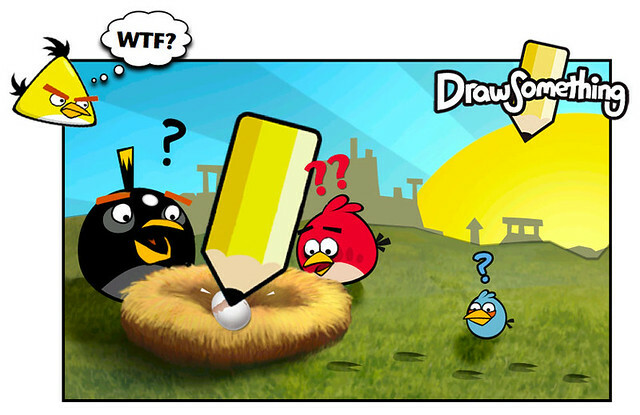 It took only 50 days for mobile juggernaut "Draw Something" to crank past 50 million downloads and take over the number one spot again in the iTunes App Store by passing Angry Birds "Space". That milestone was "no easy egg to crack" since the latest edition of Angry Birds set its own record with 10 million downloads in three days since launching on March 22nd. Social game giant Zynga who purchased the Pictionary-esque "Draw Something" from developers OMGPOP one month ago — called their $180 million acquisition "one of the fastest growing web sensations." in a statement. "We believe it’s not only the fastest growing original mobile game of all time – 50 days to hit 50 million downloads — but one of the fastest growing web sensations that we’ve seen," Zynga said. Players have created some 6 billion works of art since Draw Something debuted two months ago — growing to the current rate of 3,000 drawings a second compared to just 3 drawings per second on launch day. Draw Something is believed to generate approximately $250,000 a day for Zynga, with a paid version of the game priced at $1.99 or players can choose to opt in for the free ad supported version. Zynga is currently offering an upgrade to the paid edition at half off for a limited time. But buyers should be warned that just like Words With Friends, which allows players to compete against friends and strangers around the globe — there's an addictive quality to Draw Something that has a way of keeping you glued to the game for huge amounts of time. There is good reason why it's parked at number one with 50 millions downloads and counting. It's possible that 100 million could be much closer than anyone imagines, making Zynga's stock (ZNGA) look mighty attractive at $11.91 per share.